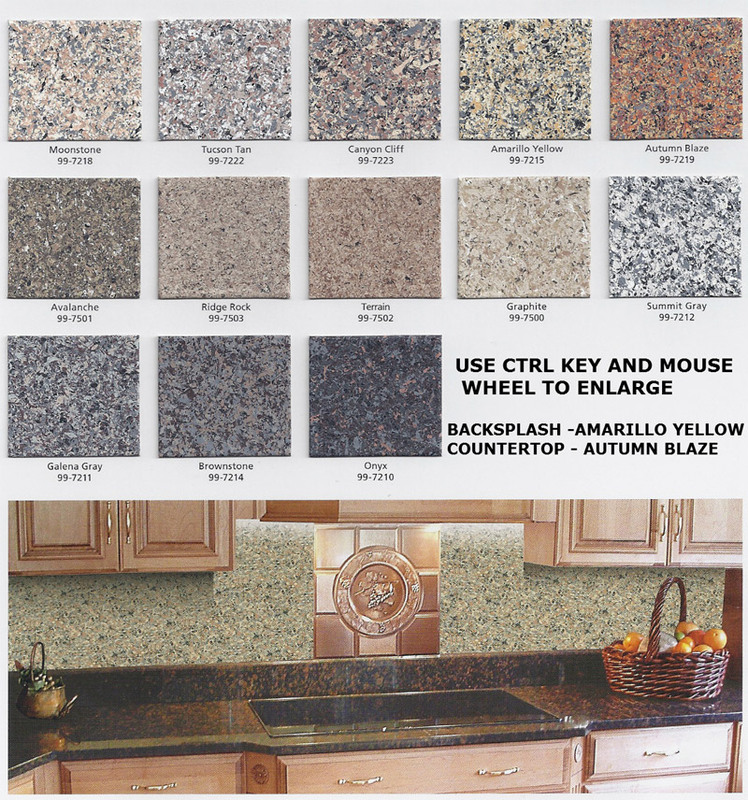 ArmorGarage Kitchen Countertop Kit - FREE SHIPPING! The ArmorGarage countertop kit is packaged so that everything you need is included. You should have the regular accessories on hand that you would for any normal paint job such as rags, painters tape, plastic and stir sticks. Please click on the Instructions tab and FAQ for additional information. I have just finished re-doing my kitchen countertops with the Avalanche kit and I used the thick top coat. I really, really love it. I had a wood and lament tops to cover. I had about 35 sq. ft. total and had enough product for the job. I prep all my counters by cleaning them with TSP and sanding them with 120 grit sandpaper, that worked good because my counters we so worn. I did do two coats of primer and two thin coats of the color. I was afraid I would not have enough for the second coat of color because I did have to open the second quart to complete the first coat, but it worked out good. I would say that no matter how slow you put on the color, you will get splatter on your floor if you do not cover them, which I did not however, I have pergo flooring so I could easily clean the floor. I did not tape around my sink or stove because we just took them out to make it easier. The instructions were easy to follow and I also called to speak with someone with a question and they were very polite and helpful. I did not need to prime my wood before I used the armor primer and because my peninsula was wide, I rolled the color in stages and it worked out great without roller marks. I would recommend the thick top coat and lightly sanding the counters before you apply the top coat for a smoother finish. The final results really looks like stone tops and does not look cheap. I have been researching different products for months ,(Giani, Spreadstone, Rustoleum) before I settled on Armorgarage. My reasons for choosing this product was because it is guaranteed, thicker than the others brands, heat resistant, and easily applied. I am thrilled with my choice. Here are some before during and after pictures for you. TUSCON TAN: Is a Light Tan and off white background with Gray,Black, and some terracotta highlights. CANYON CLIFF: Is a yellowish beige and terracotta background with touches of Gray and Black highlights. BROWNSTONE: Is a slate gray and mocha background with midnight chocolate highlights. AMARILLO YELLOW: Is a yellowish beige background with black and gray highlights. MOONSTONE: Is a light peach/beige color background with gray and light tan highlights and a hint of black. AUTUMN BLAZE: Is mustard and orange background with gray, black and hint of brick highlights. SUMMIT GRAY: Is Winter White background mixed with gray, cement and black highlights. GALENA GRAY: Is a Gray and Tan background with slate, plum and black highlights. AVALANCHE: Is a brown and dk tan background with touches cement and chocolate. RIDGE ROCK: Light tan, Dk tan background with touches of mocha and chocolate . TERRAIN: Tan and light brown background with a hint of chocolate making it very neutral and soothing to the eye. GRAPHITE: A sandstone base with touches of tan and a hint of brown and eggshell. ONYX: Black and Dark gray background with highlights of slate and terracotta. Clean and let surface dry. If surface is very smooth lightly scuff with 30 grit sandpaper to scratch up the surface. Here's how to prep the sink and countertop two ways. One is to fully tape everything and one where only the sink and back splash were done. Mix primer in can and cut in the corner with a brush and then roller on primer with supplied foam roller and let dry in 1-2 hrs. Next mix the granite paint in can until uniform in color, use supplied corner roller to cut in. Then use supplied stone effect roller(honeycomb roller) to apply granite paint. Use gentle slow strokes to apply an even thin coat from back to front and down the edge. Let completely dry, overnight if need be and then apply second coat. Once dry you can it's time for the topcoat. Stir clear coat in the can and simply roll on like regular paint. If using the extra thick topcoat apply by roller or brush, do not apply too much material at one time to avoid uneven curing. If second coat is desired let first coat completely dry first. For best results lightly sand the first coat before applying the second coat. Let topcoat dry 24 hours before use. Also click the instruction tab on the main MAIN COUNTERTOP PAGE to see a very detailed review of a customer's experience from buying to installing and using our countertop kit. We think the combination of our instructions and Kayla's will give you a complete and clear picture of how it's done. A: Coverage is rated at 50 Sf per kit but coverage may vary depending on surface being applied to and thickness applied at by user. You can order the extra Qt of Granite Paint if you are at or over the 50 SF area. Q: Can I apply this over plywood or ceramic tiles? A: Yes, just make sure the tile or plywood does not have a Mil finish on it, if it does simply sand off with number 60 grit paper. If going over tile you may want to apply the granite paint in two applications, one to fill in grout lines(make sure grout is clean before priming) and then second coat over the entire surface. Q: I bought a competitor's kit and we are not happy with the results can I coat over it with your kit. A: Yes, just sand with 80 or 100 grit sandpaper and wipe off residue. Then apply our kit per the instructions. Q: How difficult is it to apply your product. A: Our kit is designed for first time users. There is absolutely no special artistic talent needed. It's three simply steps of rolling the coating on. Other kits require squeegeeing and applying special effect flakes that are very difficult to get to look right. Q: How long do I have to wait in between coatings? And how many coats is it? A: You apply one coat of primer as you would regular paint. Then we recommend you apply the granite paint in two tin layers rather than one thick coating to ensure a smoother finish. You can apply the next coating as soon as the previous coating is tack free. Usually in about 4-5 hours. If you are applying the standard topcoat you can roll on multiple layers. If using the extra thick topcoat one layer should suffice but you can add another layer if desired. Q: How do I clean up your product? A: Soap and water is all you need for clean up of spills for the primer and granite paint. Use Xylene to clean up any of the topcoat spillage. Q: Is your coating safe to place food on? A: Yes it is 100% safe to place food on.